MSF Maker can be installed in a Microsoft Windows-based personal computer with (a) minimum RAM of 1 Gigabtyes, and (b) sizeable screen (1280x1024 minimum resolution). Several example input data sets are included in the software distribution medium/CD. To download a compressed installation file (12 Mbytes, updated October 2017), CLICK HERE. After downloading, unzip/extract the file. Copy the msfmaker08 folder & its contents to you local C drive. 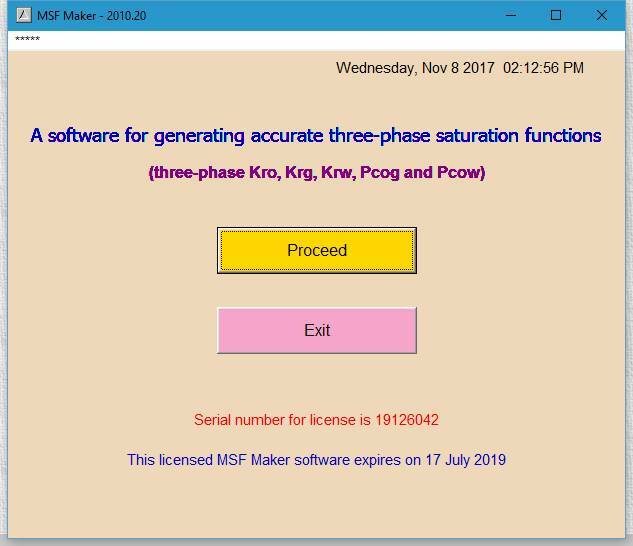 The msfmaker08 folder contains sample input data sets and a dummy license file. If you have any problem when you try to install, please contact us. Read important notes in readme.txt or readme.doc file. A welcoming window/form (Figurer 1 below) will appear when you run the software. Notice the textbox that says “Serial number for license is………” . Email this 8-digit number (generated by the software running on your PC/notebook) to msfmaker@gmail.com and we will send you a 6-month free/complimentary license.